After launching at MetroPCS back in mid-2017, the Moto E4 is now available from T-Mobile as well. The Moto E4 can be purchased from T-Mobile for $7 down and $7 per month for 24 months. The full retail price of the phone is $175. 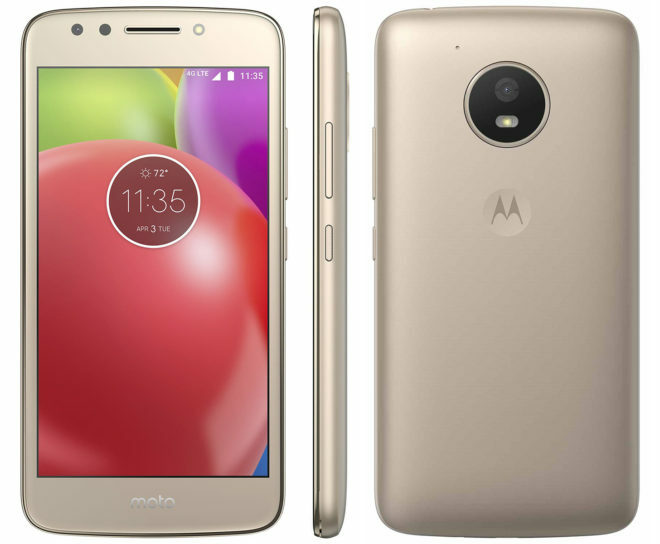 As its price suggests, the Moto E4 is an entry-level phone that includes a 5-inch 1280×720 display, quad-core Snapdragon 417 processor, 2GB of RAM, 16GB of storage, and a microSD card slot. There’s an 8-megapixel camera with f/2.2 aperture on the back of the E4 and a 5-megapixel camera with f/2.2 aperture around front. Rounding out the Moto E4’s feature list is a microUSB port, a 3.5mm headphone jack, a removable 2,800mAh battery, a water-repellent coating to protect against splashes, and Android 7.1.1 Nougat. The Moto E4 supports 4G LTE bands 1/2/4/5/7/8/12 as well as HD Voice and VoLTE on T-Mobile. The Moto E4 has been available unlocked and from MetroPCS for a while now, but it’s still nice to see the phone being sold by T-Mobile, too. This makes it easier for any interested T-Mo customers to buy the phone, especially if they’re interested in EIP financing. Why would T-Mobile continue to release phones that do not support band 71? There are not an incredible amount of options as yet, and some people don’t need band 71. The Moto E4 is a fine low cost phone but the E5 is right around the corner. All of their partners sell them for $170-175. They only sell it direct for that cost because they don’t have the overhead. Ridiculous price. The Verizon version is sold at best buy or Walmart for 49.99 and is fully unlockable for 4.99 via eBay. I have been using one on T-Mobile for months now and everything works perfect on it. $175 is absolutely mad. can use hot spot on this phone? Only thing that’s bad about this one is the lack of a finger print reader. Otherwise it’s easily.the best entry level phone. Now let’s hope they carry the new g series. Replace the HTC life with that . Interesting that the Verizon version has one but this doesn’t. $175 is absolute madness! The phone itself is great though. $175 is steep for a Moto E4. This phone should be $75 at the most. I’m guessing if they over price the phone it makes the 24 month payment plan look better. Not a bad phone, but at that price, the LG K20 is a much better buy. The 32 gb of storage on the K20 alone makes it a better deal.